Om Yoga International is an internationally recognized organisation. This is a world class training organization perfect for those looking for physically healthy body and mental development to maintain happiness, peace and harmony in their life. After successfully completing the Yoga Teacher Training program, the certificate provided is valid all over the world for you to begin your new calling! 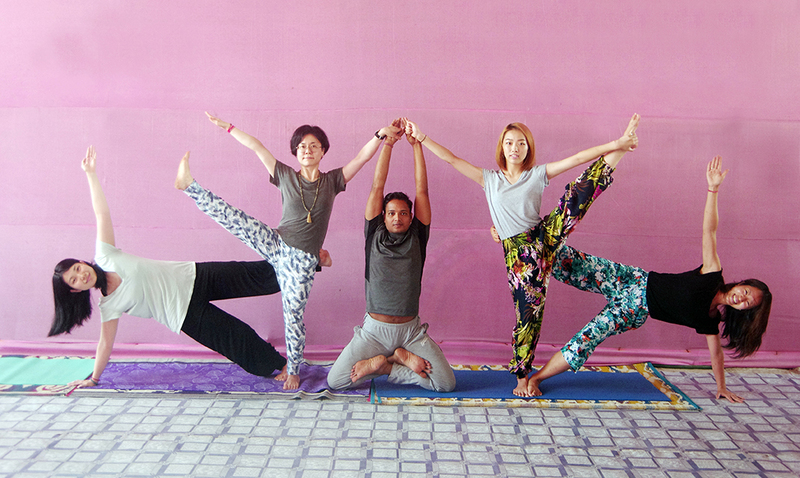 Hatha Yoga Teacher Training Course has a duration of total 30days (4 weeks). This path is for those who are physically more strong and are ready to handle physically challenges. Hatha Yoga is said to have been introduced by Swami Swatmarama in his text, Hatha Yog Pradipika and later by Rishi Gheranda in his text, Gheranda Samhita. The word ‘Ha’ means Sun(Right nadi - Pingala), ‘Tha’ means Moon(left nadi - Ida). Hatha yoga is the science of bringing balance between Pingala(right side) and Ida(left side). It is the science of activating the third, central nadi- Sushumna - which is the path to enlightenment. Hatha yoga begins with exertion. Your body may say, “That’s it, I can do no more.” Or your mind may groan, “Yoga? Oh no not again!” But you stay determined. You just do it. Every time you come out of your comfort zone little by little and reach the path. 7. Advanced Meditation Techniques like Nada Anusandhan etc..
Vedant Ashram In Rishikesh-Haridwar located on the banks of Ganga river is an ideal place for stay. The ashram is constructed in 30,000sq,feet. We have total 52 rooms in our ashram along with a garden, 2 Yoga halls, Physiotherapy hall and Panchkarma hall. The accommodation is facilitated with air-conditioning and Wi-Fi connection. The rooms are equipped with double beds, air-conditioning,Wi-Fi connection, tea/coffee kettle, hot and cold shower and towels. Note All rooms in our ashram are shared with the same gender. Mother and daughter or wife and husband can share their rooms. WHAT'S INCLUDED? WHAT'S NOT INCLUDED? • A reservation requires a deposit of 25% of the total price. • The deposit is non-refundable, if the booking is cancelled. • The rest of the payment should be paid on arrival.